Infor UAP helps your organization get the most out of your technology investment by providing "moments of understanding" throughout the software lifecycle. 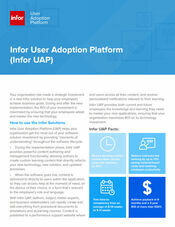 During the implementation phase, Infor UAP provides powerful content authoring and management functionality that allows authors to create custom learning content that directly reflects your new technology. When the software goes live, this content is delivered to users, right within the application, so they can access help at the moment of need, on the device of their choice, in a form that’s relevant to the employee’s role and language. With Infor UAP, authors, subject matter experts, and business stakeholders can rapidly create and edit everything from procedural documents to simulations and eLearning courses. Content is published to a performance support website where end users access all their content, and receive personalized notifications relevant to their learning. Infor UAP provides both current and future employees the knowledge and learning they need to master your new applications, ensuring that your organization maximizes ROI on its technology investment.